My family has been in the food industry for over 50 years so I grew up with the philosophy that desserts can bring a smile to anyone’s face. As a child, I always took a keen interest in my family’s restaurant outlets. In my growing years, I always enjoyed trying out new dishes and exploring food in general, depending on the available resources. This is why my decision to pursue a culinary education after completing a hotel management course was a natural transition of sorts. Do you have a degree from another college? Yes. I have a Bachelor’s in Hospitality Management. 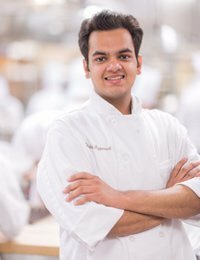 When I started looking at culinary schools to pursue a culinary education, The Culinary Institute immediately struck a chord with me because of its traditional nature and its history which came across even through its website. 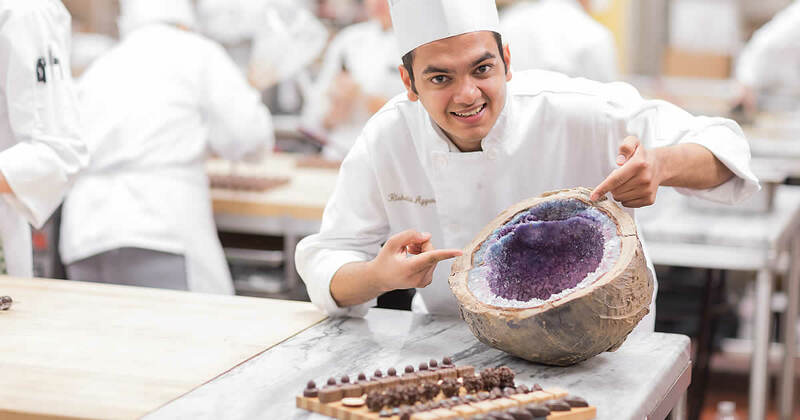 As I researched further and read about the 70 years of experience, the team of expert chefs and professors, and the world-class kitchens and bakeshops, the decision to choose CIA was a no-brainer. The scholarships motivated me to work more towards achieving my future endeavors, and the recognition helped me to stay strong even in my hard times. The best thing about the CIA is the cultural diversity and the equality among students that I have witnessed here. For international students, it is always a challenge to leave our home and pursue our education in a different country—but my transition here has been very smooth and consistent, and I really appreciate that about the CIA. I am an ambassador for international students on campus. I came into this position based on one of my chef’s recommendations and through a selection process and interview with Stephen Sobierajski. My favorite dish to make is an Indian dessert called Rasgulla, which is a round-shaped doughnut of cottage cheese, poached in light sugar syrup and served cold. This dish holds a special place in my heart because my grandmother has been making it for me since I was a child. I came to the CIA with a hotel management degree and a fair idea of the business aspect of a restaurant because of observing and learning from my father. Once I went through the various kitchen classes and academic classes, I began to see a more rounded and dimensional picture of a restaurant operation. One lesson that I have learned at the CIA, which applies not only to my education but also to life in general, is that it’s never too late to learn something new. Perhaps the most important lesson, however, is that every time you perform a new task you learn something different about it, and this to me has been very eye-opening. Another of the most important lessons I’ve learned at the CIA is that it is always important and helpful to ask questions. It is inevitable to make mistakes in the kitchen, but to ask questions about them and learn something new every time we make them makes all the difference. My goal in the future is to set up my own business that showcases a combination of French and Indian flavors. I want to apply what I’ve learned at the CIA with my roots and make desserts that incorporate both of the above. My advice to students in the future is to come to the CIA with a clean slate and start from scratch. The main reason for this is every chef has their own way of teaching and going about things. While it is beneficial to learn from your previous experience, it is of utmost importance to listen to your chefs and do as they ask.